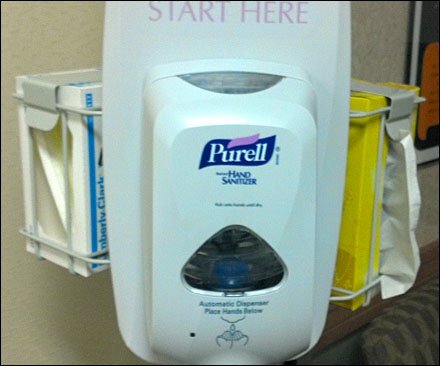 Here is a top-of-the-line 3-Way Purell Sanitizer Station from creative marketers at Purell. No you can’t buy the miracle balm at the station, but it certainly does brand the line, and keep it in the public eye at critical times and locations. Secondary to the Purell offering are tissues to the right and Kimberly Clark Earloop Face Masks to the left. I wonder if Purell and Kimber Clark are marketing allies? And why didn’t Kleenex take over the right-hand station and tissue advertising position? 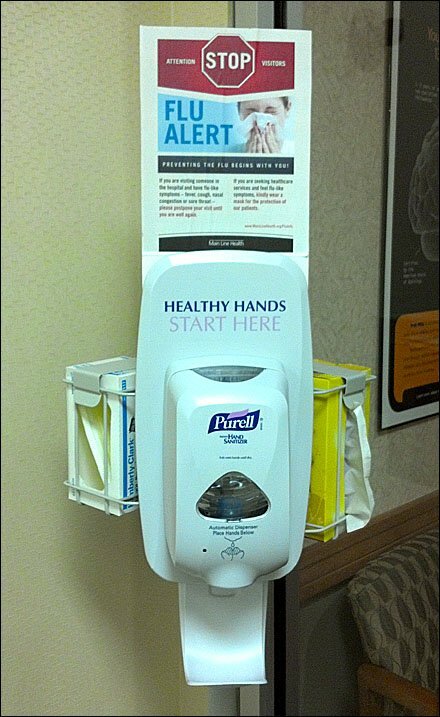 CLICK the 3-Way Purell Sanitizer Station thumbnail for a closeup view. Then order this puppy for your entrance or lobby before Flu and Cold Season.